A London man has been sentenced after officers on a proactive drugs operation stopped him in Dorking back in October. On Wednesday, 10 October 2018, officers from our Op Viking county lines drugs team stopped Tyreke Sharpe, 19, of Brixton in London, as he matched the description of a man who was believed to have been involved in the supply of drugs in East Surrey. Sharpe tried to evade police by blocking them with his bike, before attempting to run off. Officers detained him and conducted a search under section 23 of the Misuse of Drugs Act, which revealed cash and wraps of crack cocaine and heroin. In total, 19 wraps of crack cocaine and 11 of heroin were found in Sharpe’s possession with an estimated street value of around £500. Sharpe was arrested and later charged with possession with intent to supply Class A drugs. Digital examinations of Sharpe’s phone revealed conversations about drugs and a search of his home address found digital weighing scales with traces of class A and B drugs. Also found were a number of train tickets between London and East Surrey locations throughout September and October, indicating that Sharpe had been travelling to and from the area for some time as part of a drugs network. 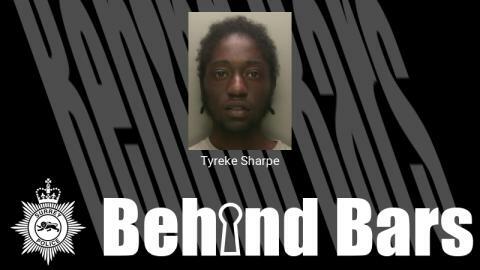 Appearing at Guildford Crown Court on Monday, 8 April, Tyreke Sharpe was sentenced to three years in prison. Investigating officer, PC Elliott Hartley, said: “Our message to cross-county drug dealers is clear – if you come into Surrey to deal drugs we will find you and deal with you robustly. “Drug dealing is a disruptive and we won’t tolerate the kind of culture that dealing brings to our county. Our proactive work will continue to make Surrey a harder place for drug deals to operate in.